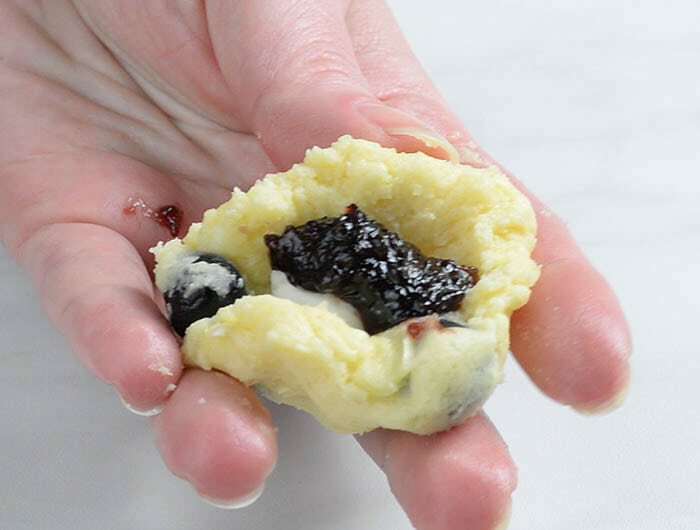 Soft and chewy Blueberry Cookies with fresh blueberries, white chocolate chunks and gooey cream cheese and blueberry jam filling in the center are really the best blueberry cookies ever. 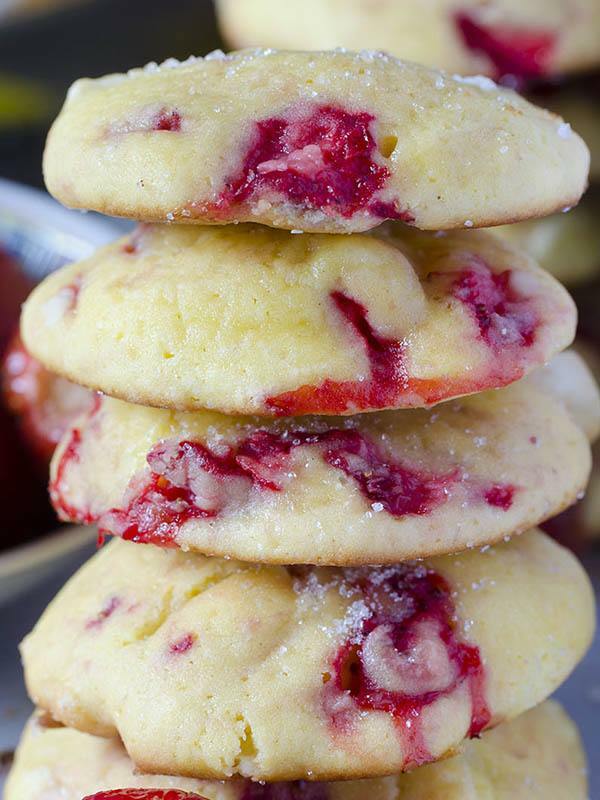 If you like the combo of white chocolate, cream cheese and berries, then you must check my Strawberry Cream Cheese Cookies with White Chocolate Chunks, too! Not long ago, I opened my blueberry baking season with delicious Blueberry Cheesecake Crumb Cake. Having a few packages of fresh blueberries in my fridge, I had to figured out what to bake next. Since my old Strawberry Cookies Recipe again become very popular these days, I wanted to offer you something similar, but new. However, it must be equally delicious, too. And that’s how I came up with these Best-Ever Blueberry Cookies. White chocolate and cream cheese match perfectly with strawberries, but It makes really awesome combo with blueberries, too. Sweet and tangy flavor combo, soft and chewy texture of these cookies and gooey filing in the center. Strawberry Cookies were made with cream cheese mixed in cookie dough, but this time I wanted to make a filling in the center of the cookies. For the filling I used cream cheese mixture and blueberry jam. Assembling the cookies was a bit tricky. The dough is a bit sticky even after the chilling time, but it was totally worth it. Blueberry Cream Cheese Cookies turned out amazing. Actually, I made a few without the filling and they taste great, too. If you don’t want to bother with the filling, just scooped out the cookie dough onto baking sheet and bake. The cookies are delicious! 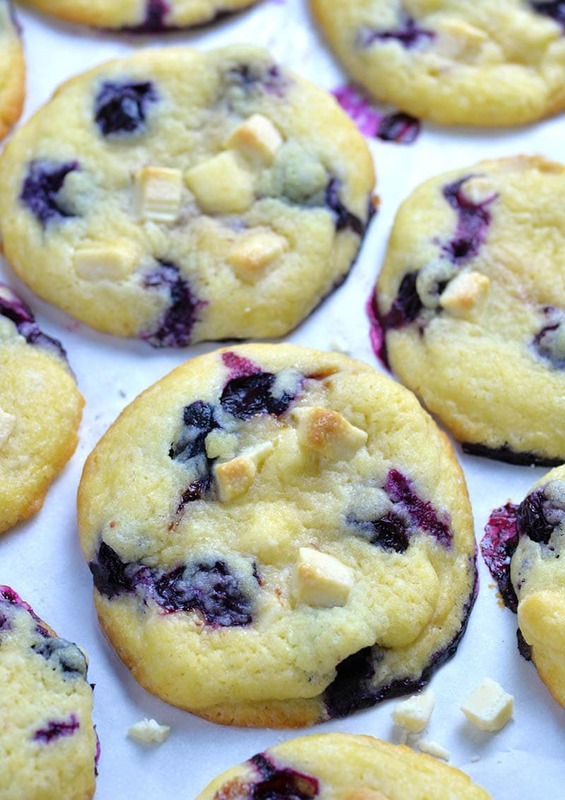 But if you want to make the best ever blueberry cookies, don’t skip the filling!!! Cream Cheese Strawberry Cookies are delicious, soft and chewy cream cheese cookies with fresh strawberries and white chocolate chunks. 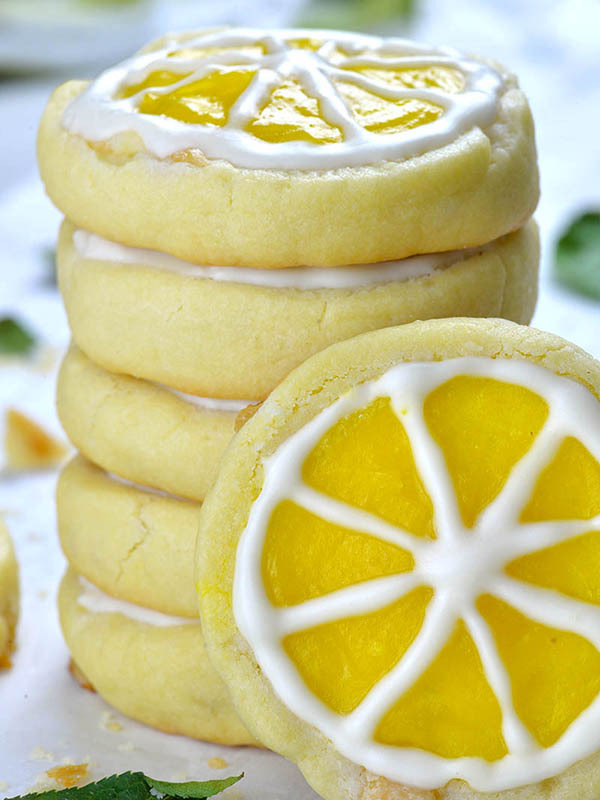 Lemon Shortbread Cookies with bits of white chocolate, topped with lemon curd are delicious and refreshing summer treat. 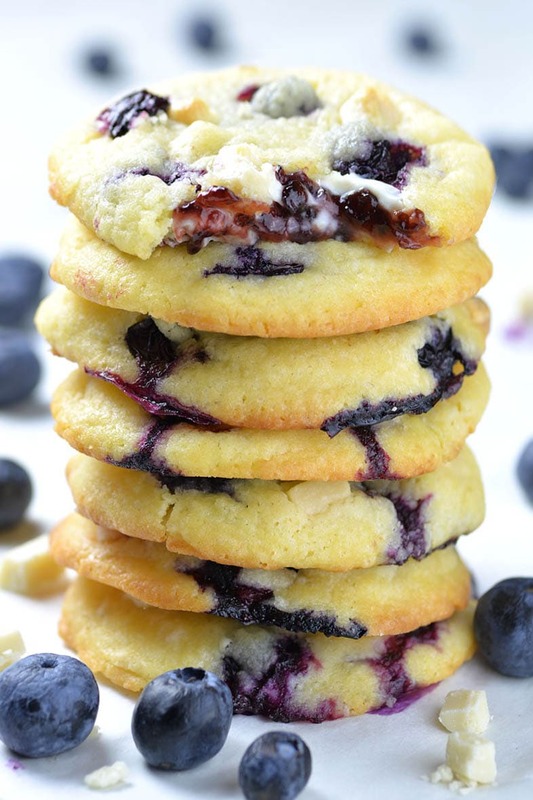 Soft and chewy Blueberry Cookies with fresh blueberries, white chocolate chunks and gooey cream cheese and blueberry jam filling in the center are really the best blueberry cookies ever. In a small bowl whisk together dry ingredients: flour, corn starch, salt and baking powder, set aside. Cream butter and sugar on high speed for about 2 minutes, until light and creamy. Add egg and vanilla and mix to combine. Fold in about ¾ of white chocolate chunks, reserve remaining to press on top of cookies. Finally, fold in blueberries with a rubber spatula, but do this really gently and try not to break the berries. The dough will be thick and sticky. Cover and refrigerate for 2 hours. To make the filling, mix cream cheese, vanilla and powdered sugar just to combine and place in the fridge. When ready to bake preheat the oven to 350 F and line baking sheets with parchment paper. Arrange cookie balls onto baking sheet leaving 3 inches apart, because the cookies will spread while baking. Bake 16-18 minutes. Cool on baking sheet for 10 minutes, then transfer on a rack too cool completely. That is honestly the most incredible cookie recipe of all time. 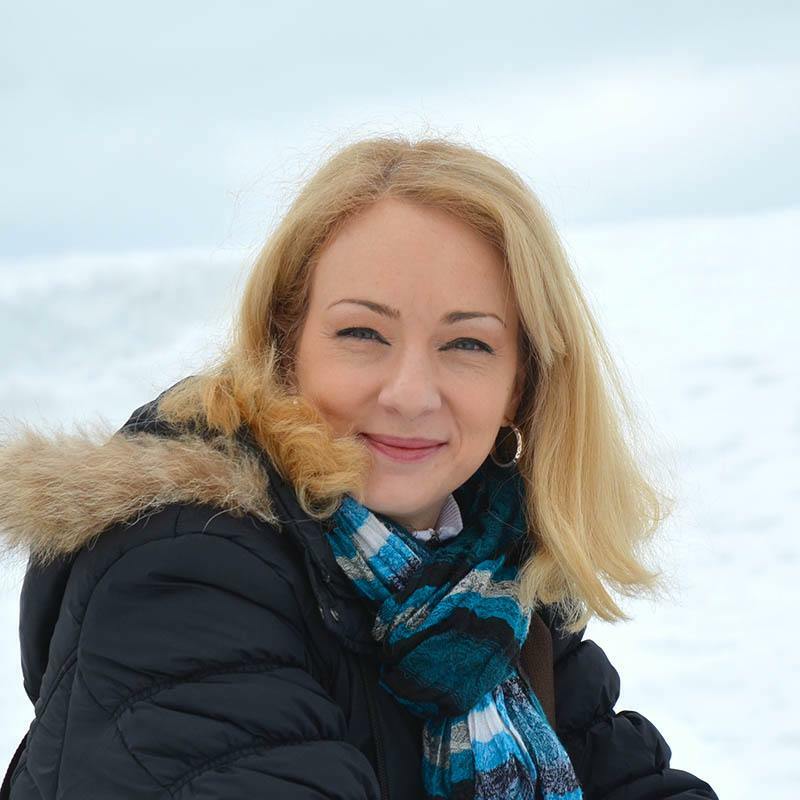 Looking forward to scouring your site. I am interested in ordering your product. It looks so delicious. Can frozen blueberries be used fir this recipe? Hi Faye, I haven’t tried with frozen blueberries, but I think it won’t work well. I made them with frozen blueberries today… the taste is still there, but the dough was really soft and did not hold up. I doubled the recipe and made with frozen blueberries but instead. I used a 9 x 12 pan and put half the mix pressed into a pan lined with foil for easy removal. I then combined the blueberry jam with the cream cheese mix and smeared that all over the middle section. I then topped it with crumbles of the remainder of the topping…pressed a bit. Baked for about 20 to 30 minutes while checking with a toothpick because I had no idea how long it would be before it would be done. I set the oven on 375. The bars were delicious! I’m working on making these now! Can I ask why the dough needs to be refrigerated for 2 hours? Assuming it just helps them set up better? Just wondering if it would make a difference if I skipped that part. I also am not using the filling portion. I love your recipes! Excited to try this one! Hi Lauren, cookies will spread too much if the dough is not chilled. Why do you need to freeze the cookies before you bake them? Hi Jb, ithelps them keep the shape and don’t spread too much. hey,this recipe looks delicious will be sure to try these out. if I wanted to make about 30 to 40 cookies how much ingredients would I need please? Hi fee, this recipe makes about 12 cookies, so you’ll need to triple the ingredients. Although easy to get everything ready to make, once you start putting these together they look like the size of softballs. I decided not to use the filling after trying to do a few of them. Waiting for them to come out of the oven. Time will tell. Hi! I wonder what about natural fruit blueberries instead frozen. It will work ? This is the best cookies I have ever had, period! These are the best cookies I’ve ever had, period! would dried blueberries work with this? Hi Cynthia, I have’t tried, but I think it could work. HI Greg, they are Ok for 2 days in an air-tight container at the room temperature. Made these and was a little disappointed. I usually don’t comment on recipes …Cookie looked nothing like the picture…..Did not spread out at all…..Taste was just okay ….Honestly, probably won’t make again. These cookies didn’t spread at all nor have a light texture like the images. HI Gabriele, I’m sorry to hear that. Maybe the flour wasn’t measured correctly. Too much flour makes stops them from spreading and makes them dense. Great recipe! And it works well without the filling too! if you don’t patt the top of the mix down before they go in the oven they will taste more like a cake, but I think this may be better than normal cookies!? This is a one and done recipe. Dough was very difficult to work with, the blueberries just rolled off the dough and wouldn’t fold in. Haven’t tasted them yet but because of the frustration making them I will not try again. I consider myself a very experienced baker, love baking and making wedding cakes but this is not a good recipe in my opinion. Why can’t I see any recipe’s on your website? I see the pictures and comments, but no recipe? No link to a recipe? When it comes time for the refrigeration time could I freeze them instead and bake them later? I also didn’t use the filling the last time as I did not have some of the ingredients and they were delicious, not overly sweet which was perfect. Hi Tammy, sorry, I have’t tried that. You can freeze baked muffins.